#1. This week's number one is former international forward Brock Motum (208-90, college: WSU, currently plays in Turkey). He was the major contributor in a 3-point Anadolu Efes' victory against the fifth-ranked Besiktas (12-16) 95-92 in a derby game in the Turkish BSL in Monday night's game. Motum scored 14 points and grabbed 7 rebounds in 23 minutes on the court. Anadolu Efes Istanbul (20-3) is placed first in the BSL. It was his team's 12th consecutive victory in a row. There are only three games left until the end of the Regular Season. So now every game will be critical. Motum has individually a very good year with high stats. He averages: 18.0ppg, 5.8rpg, 1.3apg, 3FGP: 39.5% and FT: 79.4% in 12 games he played so far. Motum played for the Australian senior national team three years ago. #2. Second place goes to an international power forward Mangok Mathiang (208-92, college: Louisville, currently plays in Italy). He led Vanoli Cremona to a victory over one of league's weakest teams VL Pesaro (7-18) crushing them 97-64 in the Italian Serie A last Sunday. Mathiang was MVP of the game. He recorded a double-double by scoring 20 points and getting 14 rebounds. Mathiang also added 2 blocks; quite an impressive performance considering it's only his second season in pro basketball. Vanoli Basket Cremona (16-9) is placed third in the Serie A. Mathiang has relatively good stats this season: 10.5ppg, 9.7rpg, 2FGP: 60.6%(114-188) and FT: 52.2%. He has a dual citizenship: Australian and South Sudanese. Mathiang is in the roster of the Australian senior national team. #3. The Australian player who performed third best last week abroad was former international small forward Joe Ingles (203-87, currently plays in NBA). He contributed to an easy victory against the Phoenix Suns (19-62) crushing them 118-97 in the NBA on Wednesday night. Ingles scored 27 points (!!! ), had 5 rebounds and dished 8 assists in 35 minutes. The Utah Jazz has a solid 49-31 record this season. It was his team's seventh consecutive victory in a row. There are only two games left until the end of the NBA Regular Season. So now every game is very crucial. It's Ingles' fifth year with the team. He has very impressive stats this season: 12.2ppg, 4.0rpg, 5.7apg, 1.2spg, 2FGP: 53.2%, 3FGP: 39.2% and FT: 70.2% in 80 games. Ingles played for the Australian national team three years ago. #4. Point guard Ben Simmons (208-96, college: LSU, currently plays in NBA) could not help the Philadelphia 76ers (50-30) in their last game. Despite Simmons' very good performance the Philadelphia 76ers (50-30) lost 122-130 at home to the Atlanta Hawks. He had a double-double by scoring 15 points and getting the same number of rebounds. Simmons also added 8 assists and 4 steals in 33 minutes; not bad, considering it's only his third season in pro basketball. It was 76ers' third consecutive loss in a row. There are only two games left until the end of the NBA Regular Season. So now every game will be important. Simmons has very impressive stats this year: 16.9ppg, 8.9rpg, 7.8apg and 1.4spg in 78 games. He used to play for the Australian national team back in 2014. #5. Former U22 international swingman Keanu Pinder (206-95, college: Arizona, currently plays in Poland) contributed to a 3-point Legia's victory against the league outsider Miasto Szkla (5-21) 88-85 in the Polish EBL in Sunday night's game. Pinder had a double-double by scoring 16 points and getting 12 rebounds in 20 minutes. Legia Warszawais placed second in the EBL. It's Pinder's first season with the team. This year his overall stats are: 6.2ppg and 3.4rpg in 21 games. Pinder used to play for the Australian U22 national team four years ago. #6. Power forward Jonah Bolden (208-96, college: UCLA, currently plays in NBA) is a teammate of previously mentioned Ben Simmons and both played together in the last NBA game. 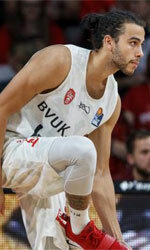 Bolden was not able to help the Philadelphia 76ers (50-30) in their last game on Wednesday. Despite his good performance the Philadelphia 76ers (50-30) were defeated 130-122 on their home court in Philadelphia by the Atlanta Hawks. Bolden recorded a double-double by scoring 13 points and getting 10 rebounds. He also added 3 assists. Bolden's total stats this season are: 4.8ppg and 3.8rpg. He is a former U19 international player as he played for the Australian team six years ago. #7. Former international point guard Patrick Mills (183-88, college: St.Mary's, CA, currently plays in NBA) contributed to an easy victory against the Washington Wizards (32-49) 129-112 in the NBA on Friday night. Mills scored 17 points and added 3 passes in 20 minutes. The San Antonio Spurs have 47-34 record this season. His team will play only one more game in the NBA Regular Season. Mills is one of the most experienced players in a team as it's his seventh year in Spurs' roster. This season Mills has relatively solid stats: 10.0ppg, 2.2rpg and 3.0apg in 81 games. He used to play for the Australian national team three years ago. #8. Forward Thon Maker (216-97, currently plays in NBA) was not able to secure a victory for the Detroit Pistons (39-41) in their game against the Indiana Pacers (47-34) in the NBA. Despite his very good performance in Monday night's game Maker recorded 14 points, 6 rebounds and 4 blocks. There are only two games left until the end of the NBA Regular Season. Maker's total stats this season are: 5.8ppg, 3.8rpg and 1.2bpg. He plays currently for the Australian national team. #9. Former international center Aron Baynes (208-86, college: WSU, currently plays in NBA) contributed to an easy victory against the Indiana Pacers (47-34) crushing them 117-97 in the NBA last Friday. Baynes had a double-double by scoring 11 points and getting the same number of rebounds. He also added 2 blocks in 27 minutes. The Boston Celtics have 48-33 record this season. It was his team's third consecutive victory in a row. They will play only one more game in the NBA Regular Season. This year Baynes' total stats are: 5.6ppg, 4.7rpg and 1.1apg in 51 games. He used to play for the Australian national team three years ago. #10. Power forward Daniel Johnson (212-88, college: Pepperdine, currently plays in Japan) couldn't help Tokyo Z (20-36) in their game against Shinshu BW (45-11) in the Japanese B2 League. Despite his very good performance on Sunday night Johnson recorded a double-double by scoring 33 points and getting 11 rebounds. He also added 4 assists and 3 steals. The Regular Season already ended. This season Johnson has very high stats. He averages: 23.2ppg, 11.6rpg, 4.0apg and 1.5spg. Johnson is an international player who is currently on the senior Australian National Team roster. #11. Former University international swingman Xavier Cooks (203-95, college: Winthrop, currently plays in Germany) contributed to a s Oliver Baskets' victory against the 13th-ranked Deutsche Bank Skyliners 72-63 in the German BBL in Friday night's game. He scored 7 points, had 7 rebounds and dished 4 assists in 31 minutes. Cooks has reliable stats this year: 11.1ppg, 5.5rpg, 1.9apg and 1.1spg in 27 games. He used to play for the Australian university national team two years ago. #12. Former international point guard Joshua Wilcher (178-91, college: Cent.Wyoming, currently plays in United Kingdom) couldn't help one of league's weakest teams Plymouth Raiders in their game against Manchester Giants in the British BBL. Despite his very good performance last Sunday Wilcher recorded a double-double by scoring 23 points and making 10 passes. He also added 4 rebounds. This season Wilcher has very high stats. He averages: 17.3ppg, 3.5rpg, 6.9apg and 1.3spg. Wilcher used to play for the Australian national team back in 2009. #13. Former U22 international forward Deng Deng (203-92, college: Baylor, currently plays in Poland) helped MKS Dabrowa Gornicza win their game against the 12th-ranked HydroTruck Radom 76-65 in the Polish EBL in Sunday night's game. He scored 12 points and grabbed 6 rebounds. Deng averaged so far 10.3ppg and 6.7rpg. He used to play for the Australian U22 national team four years ago. #14. Former international forward Ryan Broekhoff (197-90, college: Valpo, currently plays in NBA) couldn't help the Dallas Mavericks in their game against the Memphis Grizzlies in the NBA. Broekhoff scored 9 points and grabbed 6 rebounds in 24 minutes. His team lost 112-122 in the NBA. Broekhoff has averaged so far 4.2ppg and 1.6rpg in 39 games. He used to play for the Australian national team back in 2016. #15. International power forward Nathan Jawai (209-86, college: Midland CC, currently plays in France) helped Levallois win their game against the 16th-ranked Provence Basket 72-64 in the French Jeep ELITE ProA in Friday night's game. Jawai recorded 11 points and grabbed 4 rebounds in only a mere 12 minutes. Jawai has averaged so far 6.4ppg and 1.4rpg in five games. He is also in the roster of the Australian national team. #1. Kyrie Irving (190-G-92, college: Duke, currently plays in NBA) led Boston Celtics to a victory over the Miami Heat (38-42) 110-105 in the NBA in Monday night's game. He was the best player in that game. Irving recorded 25 points, 8 rebounds and 3 assists (made all of his six free throws). The Boston Celtics have 48-33 record this season. It was his team's third consecutive victory in a row. They will play only one more game in the NBA Regular Season. And that game will be critical. Irving has individually a very good season with high stats. He averages: 23.8ppg, 5.0rpg, 6.9apg and 1.6spg. Irving is a naturalized American. Strangely he has never played in Australia. #2. Experienced Timothy Kearney (201-F/G-86, currently plays in Sweden) was the main contributor in a BC Lulea's victory against the closely-ranked KFUM Jamtland (23-13) crushing them 110-80 in the Swedish Basketligan on Sunday night. Kearney was the best player in that game. He scored 24 points, had 8 boards, passed 3 assists and added 5 steals. BC Lulea (24-12) is placed fourth in the Basketligan. Kearney has been at the team for nine years. Kearney's overall stats this season are: 5.2ppg and 3.2rpg. He has a dual citizenship: Australian and Swedish. #3. Dominic Gilbert (198-G/F-96, college: UBC, currently plays in Croatia) contributed to an easy victory against the closely-ranked Split (12-8) 99-84 in the Croatian Premijer Liga on Sunday night. He recorded 9 points in 19 minutes. It was the game of the round between two top 4 ranked teams. KK Cibona VIP Zagreb (16-4) is placed first in the Premijer Liga. It was his team's fourth consecutive victory in a row. There are only two games left until the end of the Regular Season. Gilbert has averaged so far 6.6ppg and 2.9rpg in 19 games he played so far. #4. Bradwyn Guinto (198-F-91, currently plays in Philippines) contributed to a 3-point Global Port's victory against the third-ranked Ginebra Kings (7-4) 100-97 in the Filipino PBA on Wednesday night. Guinto scored 14 points and grabbed 5 rebounds. Globalport Batang Pier (5-6) is placed seventh in the PBA. It was his team's third consecutive victory in a row. The Regular Season already ended. Guinto has averaged so far 5.3ppg and 3.8rpg. He is another player who holds two passports: Australian and Filipino. #5. Rasmus Bach (193-G, college: Fort Lewis, currently plays in Denmark) was the major contributor in Randers' victory against the fourth-ranked Svendborg (13-11) 79-73 in the Danish BasketLigaen in Thursday night's game. Bach scored 17 points and grabbed 8 rebounds (was perfect 6-for-6 from the free throw line). Randers Cimbria Basketball (13-11) is placed fifth in ProA group. Bach averaged so far 10.3ppg, 3.8rpg, 1.6apg and 1.4spg. He has both Australian and Danish nationalities. #6. Tony Tolovae (196-G-92, currently plays in Norway) contributed to a 3-point Gimle BBK's victory against the league leader Kongsberg 86-83 in the Norwegian BLNO on Thursday night. Tolovae recorded 20 points, 5 rebounds, 4 assists and 3 steals. This season Tolovae has very high stats. He averages: 16.7ppg, 5.0rpg, 2.9apg and 1.9spg. Tolovae also holds two passports: Australian and New Zealand. #7. Joseph Lual Acuil (213-F-94, college: Baylor, currently plays in Israel) could not help H.Galilee (17-9) in their last game. Despite his very good performance H.Galilee lost 67-72 at home to the lower-ranked (#6) Ironi Ashkelon. Lual Acuil had a double-double by scoring 18 points and getting 12 rebounds. He also added 3 assists and 2 blocks in 30 minutes. Lual Acuil has very impressive stats this year: 20.1ppg, 9.5rpg, 1.1apg and 1.8bpg in eight games. He has dual citizenship: Australian and Sudanese. #8. Deng Adel (201-F-97, college: Louisville, currently plays in NBA) was not able to help the Cleveland Cavaliers in their game against the San Antonio Spurs in the NBA. Adel recorded 5 points. His team were crushed by 22 points 112-90 in the NBA. Adel has averaged so far 1.9ppg and 1.1rpg. He has dual citizenship: South Sudanese and Australian. #9. Michael Vigor (206-C/F-90, currently plays in United Kingdom) was not able to secure a victory for Bristol Acadamy Flyers (13-3) in their last game on Sunday. Despite Vigor's good performance the league leader Bristol Acadamy Flyers was edged 113-111 on the road by the lower-ranked Glasgow Rocks (#4). He recorded 10 points and grabbed 7 rebounds. Vigor has averaged so far 6.5ppg, 3.9rpg and 1.7apg. He has Scottish and Australian nationalities. #10. Mayan Kiir (206-F-98, currently plays college basketball in the States) managed to help University of South Florida in a victory against the De Paul University 77-65 in the NCAA Quarter-Finals in Friday night's game. Kiir scored only 4 points in 10 minutes. Kiir has averaged so far 4.4ppg and 2.5rpg in 37 games. He has dual citizenship: Australian and South Sudanese.